Our ‘Notes for Women’ concert at St George’s Bristol on 28 April will feature four cantatas by Barbara Strozzi: Che si può fare [What can I do?] from Op.8 (1664), Sino alla morte [Until death] from Op.7 (1659), Begli Occhi [Beautiful Eyes] from Op.3 (1654), and Lagrime mie [My tears], also from her Op.7 set. They will be performed by Argentinian soprano Mariana Flores, who has built an international reputation as an interpreter of the Baroque repertoire. Her recordings of Strozzi songs have been widely acclaimed. Click here for concert details. Barbara was born in 1619 to Isabella Garzoni, a longtime servant to Giulio Strozzi, a well-connected Venetian intellectual and poet. Barbara’s father was unknown, but may well have been her mother’s master, who soon adopted her as his daughter. Her musical talent was evident to Giulio from an early age, and he arranged for Barbara to have instruction from Francesco Cavalli, one of the great composers of the period and a pioneer in the exciting new genre of opera. 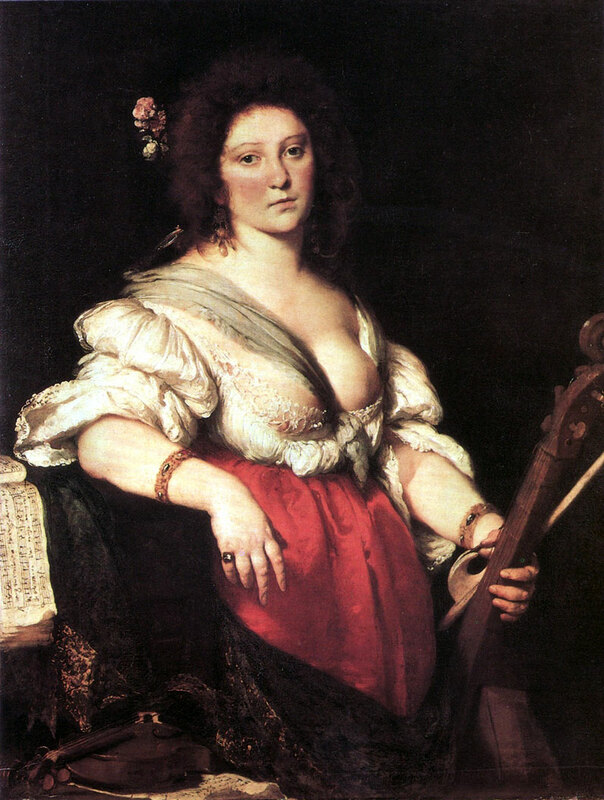 At the age of 15 she was described as ‘la virtuosissima cantatrice di Giulio Strozzi’, and at 18 she took the name Barbara Strozzi, by which time she had already established a reputation as an exceptional virtuoso singer. In 1637, Giulio founded the Accademia degli Unisoni, a musical offshoot of a literary academy of which he was a member. Barbara featured as the star turn at meetings of the Unisoni, both singing as well as generally acting as hostess, and suggesting topics for the debates that took place at each meeting. Sexual slander was common in the world of Venetian academies, and Barbara soon became the subject of anonymous comments (perhaps by members of the Unisoni) implying that she was a courtesan, and that her musical talent was not the only reason she was so popular. We may never know the truth of these allegations, although we do know that Barbara never married, but had four children during the early 1640s, at least three of which are believed to have been fathered by the wealthy nobleman Giovanni Vidman, a close friend of Giulio and a patron of the arts. It is perhaps also relevant that the only known portrait of Barbara, dating from around this time, portrays her with one breast almost fully exposed. Whether or not Giulio’s ambitions for his adopted daughter were entirely honorable, his promotion of her talents at the Unisoni and elsewhere certainly made her famous, and this no doubt contributed to her subsequent success as a composer. Barbara Strozzi’s first book of madrigals was published in 1644, when she was 25, and sold well. She was even able to loan Vidman some money, which was repaid when he died in 1648. Giulio died in 1652, leaving nothing to Barbara, yet she was able to continue to make a modest living from composing, publishing eight books of madrigals, arias and cantatas (mainly for solo soprano voice and continuo) between 1644 and 1664. All of these publications were dedicated to wealthy and important patrons. Her opus 4, dedicated to the Duke of Mantua in 1655, is the only one of her collections that is lost. Thirteen years after her last publication, aged 58, Barbara was on a visit to Padua, where she was taken ill and died on 11 November 1677. She is buried in the Church of the Eremitani in Padua. Apart from one volume of sacred songs, all of Strozzi’s compositions are secular, and are mainly on the theme of love. Some of the poetic texts were written by Giulio Strozzi, although most are by anonymous authors, probably including other members of the Unisoni, and perhaps Barbara herself. They range from short strophic arias (where each verse is sung to the same music), to more lengthy cantatas in several varied sections. Strozzi’s cantatas are often passionate and dramatic and full of contrasts in response to the meaning of the poetic texts. This no doubt reflects her training with Cavalli, one of the masters of early Italian opera, although her style is more lyrical. It is very much singer’s music, most of which would have been performed by Strozzi herself. Like many other women of her time and place, Barbara Strozzi spent much of her life as a mere puppet – of her adoptive father, of Vidman, of the Unisoni, or of Venice itself – but she nevertheless grasped the opportunities to forge a successful career as a singer and composer. Although her fame faded after her death, the seven remarkable surviving collections of her music are now, some 400 years later, bringing her the lasting respect and admiration that she surely sought during her lifetime.